Place all ingredients in a mixer bowl fitted with a hook attachment. Knead on a medium speed for 15-20 min. Dough should be elastic, with good gluten development. Prove for 1 hour, carefully degas and refrigerate overnight. Portion and shape the dough, place in moulds and prove for 2 hours at 28° C and 60% humidity. Bake at 210° C for 12 min. Bring milk and glucose to a boil. Gradually pour over chocolate creating a ganache. Emulsify. Place all ingredients except black currants into a sauce pan and bring to a boil. Cook on medium heat for 10 min. Strain. Add the berries, cover and refrigerate overnight. The next day strain and save the liquid for Elderberry Reduction. Make Swiss meringue: place egg whites with dextrose into a bain marie and warm to 50° C, whisking all the time. Make a pastry cream with milk, cream, egg yolk, sugar and cornflour. Add melted chocolate, emulsify. Gently combine the two mixtures. Immediately, pipe into individual log moulds and freeze. Place marinating liquid and glucose in a sauce pan and gently reduce by half. Make dry caramel, pour on a silpat, let cool down. Grind hardened caramel in a food processor into fine powder. Sift a fine layer of caramel powder on a tray with silpat and a stencil, remove the stencil and place tray in the oven at 200° C for 1 min to melt the sugar. Let cool, gently lift tuiles and store them in a air tight container with silica gel. Place butter, sugar and orange juice in a saucepan and bring to a boil to dissolve sugar. Place sesame seeds in a mixer bowl fitted with a paddle attachment, add orange-butter mixture and mix to combine. Let set in fridge. Spread the mixture on a tray with a silpat over a stencil, remove the stencil and cook at 170° C for 10 min. Fresh mango, diced into 1 cm cubes, chilled. Deposit 12 gr of warm Cacao Barry Inaya™ 65% sauce into brioche cavity, let brioche absorb the sauce. Place a sesame crunchy rectangle on top of mango. Place a log of frozen chiboust on top of sesame crunchy. Temper. 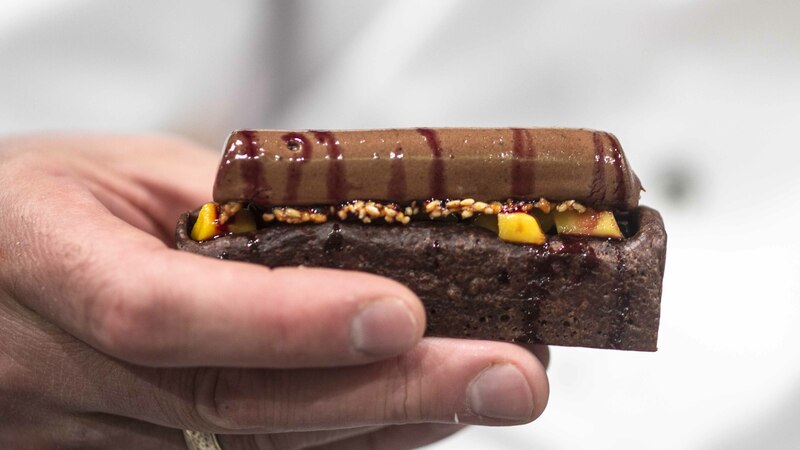 Place a caramel tuile on top of chiboust and immediately put the snack in a preheated salamander grill for 1 min to melt caramel and warm the chiboust. Drizzle with Elderberry Reduction and serve immediately.